No company has tried to make the stylus the Next Big Thing as much as Microsoft, and it’s pushing harder than ever with the upcoming Windows 10 Anniversary Update. And though it’ll be a little while before the features arrive for beta testers through Microsoft’s Insider program – let alone general Windows customers, who will get the update this summer – I was able to get a brief hands on with the new features atBuild 2016. You might’ve been surprised by the focus on ink during Microsoft’s keynote presentation; after all, who truly uses styluses anymore? Lest the above make you think I’m a stylus hater (not to mention the title of this post), I’m about as far from that as it gets. I’ve used some form of a tablet PC since Vista. But it’s because I’m used to being the only person I know who regularly uses a stylus that I understand how difficult it is to convince mainstream users of its value. For many people buying a Surface, the Pen is just a cool feature to have that they rarely use – there simply aren’t enough Windows apps that support it. You need a reason to use the stylus, and so far, unless you’re a designer or an artist, those are few and far between. 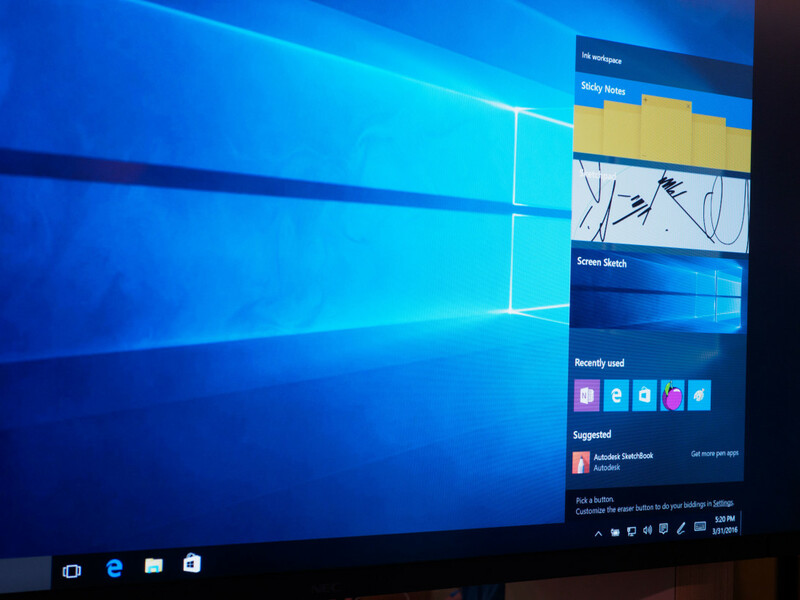 The upcoming Ink Workspace – which you can access from any app through either a quick click on your Pen’s eraser or a taskbar button – is meant to fix that. Windows Ink pops up to the side of your display. Perhaps most useful, Sticky Notes is now integrated into the Ink Workspace and will get its first significant revamp since it were launched way back in 2002. You can now open notes from anywhere by summoning the Ink Workspace, or by holding down on your Pen’s eraser for a brief moment. Also, the rest of the screen now dims, which is intended to help you focus on what you’re writing. While the convenient shortcuts will get people to use Notes more often, Microsoft thinks the true selling point will be Cortana’s intelligent handwriting recognition. For example, you can write a note reminding yourself to call a friend, and Cortana will be able to set an alert to keep you in check later in the day; you’ll even see a reminder and calendar event displayed on the note itself. It’s reminiscent of the functionality displayed in Microsoft’s old Courier concept. In fact, Kevin Gallo, vice president of Windows Developer, confirmed to me that some of the minds behind Courier are spearheading Ink Platform’s expansion. If you need a bigger canvas for your thoughts, Microsoft now offers a whiteboard, which could be handy when you need to make a quick diagram or sketch – or maybe if you’re just bored. It’s similar to writing in OneNote, except you have access to a wider color palette. Microsoft also created a pencil tool that mimics the texture of graphite on paper for more realistic drawings. Plus, there’s that handy ruler they showed off in the keynote presentation. Then there’s the Screen Sketch tool, which will be useful if you often need to annotate whatever’s on your display and quickly share it. It’s a lot like Office Snip, except baked right into Windows. It also comes in handy if you want to draw a mustache and goatee on a friend’s face. We won’t judge. Annotate whatever is on your screen. Of course, aside from the intelligent handwriting recognition, none of this is something you couldn’t already do with a plethora of other Windows apps. 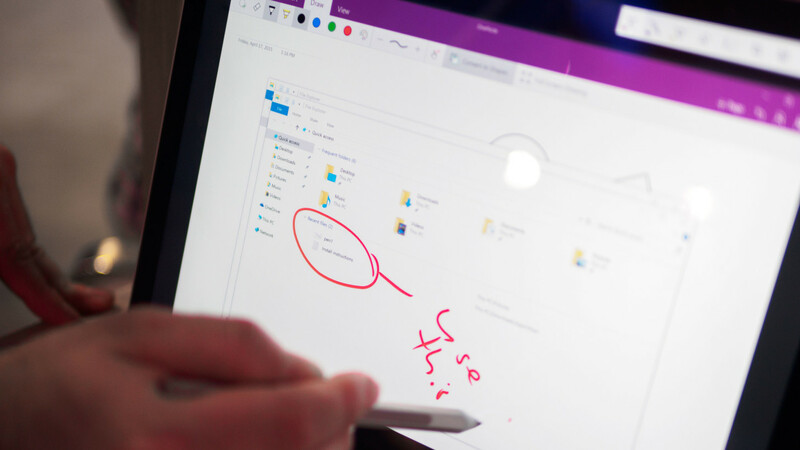 But that’s not the point; by making these tools native to the OS, Microsoft is hoping to change the perception of the stylus from a niche accessory to an integral pillar of the Windows experience. You can even jot down notes right from your lockscreen now. It’s an interesting contrast to Apple’s take on its own stylus; whereas you can use a Windows stylus for any interactions with the touchscreen, you can’t use the Apple Pencil even for scrolling through websites. Two very different takes on the stylus. That’s where Microsoft has an advantage: the Universal Windows Platform (UWP), AKA Microsoft’s attempt to change app-making forever. While Apple sees the stylus as an accessory with a very specific purpose that shouldn’t overlap with touch controls, Microsoft wants developers to build stylus support into every app. It takes only two lines of code for UWP developers to add the whiteboard, for instance, and there are a ton of new APIs for things like the rulers or custom stencils, as well as using touch to modify your handrawn shapes. Another nifty API: an update to the OneNote UWP app allows you to automatically turn hand-drawn shapes into perfect geometric figures. Microsoft also take a bit more of a power-user approach with its Pen Settings menu, which contains a lot of other features that will make artists happy. I particularly like the ability to hide the stylus cursor. I’ve personally found it distracting, and Microsoft should trust the accuracy of its stylus enough that it doesn’t need a cursor. 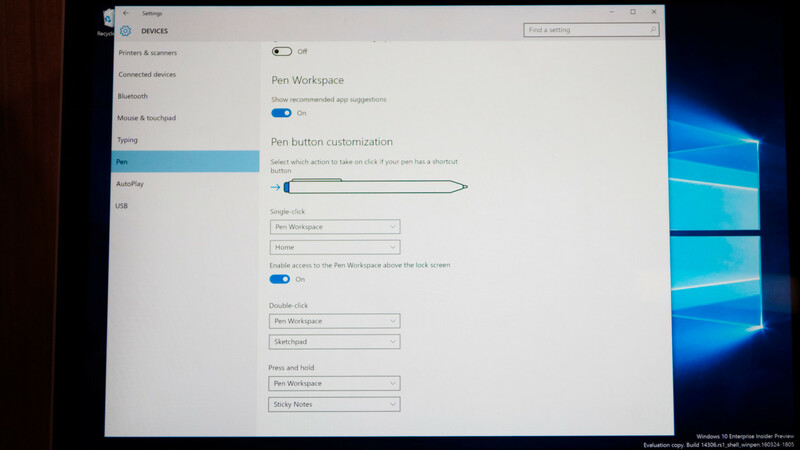 Microsoft tells me that addition was the direct result of Insider feedback, as well as the multitude of other new options in the Pen settings menu. These mainly allow you to customize the actions of any button on your Pen – including non-Microsoft styluses – for easy access to a variety of shortcuts. These are all additions that should make note-takers happy, but many would still agree that Apple simply has superior hardware for artwork, myself included. Microsoft’s Pen may be fine for note-taking, but Apple’s noticeably lower latency and tilt sensitivity for expanded shading effects and advanced brushstrokes make all the difference. It appears Microsoft is looking to change that, too. It says software-related latency has been reduced to be virtually imperceptible by human eyes – any visible lag is the result of hardware limitations it’s working to improve in the next generation of styluses. As for tilt-sensitivity, you can expect that in the near future too. Microsoft wouldn’t explicitly confirm it’s working on a tilt-sensitive stylus, but was quick to point out the fact that its Ink API already supports it – the hardware simply isn’t there to take advantage just yet. The company then reiterated to me its new partnership with Wacom, with which it will collaborate to release a ‘universal’ stylus that works on all Pen-enabled Windows 10 PCs this holiday season. Wacom does make some tilt-sensitive pens; if the two companies want to take the fight to Apple, I’d be very surprised not to see a tilt-sensitive pen with lower latency out later this year. The return of the stylus? The chances of the stylus catching on again after Apple worked so hard to eliminate it seem slim. 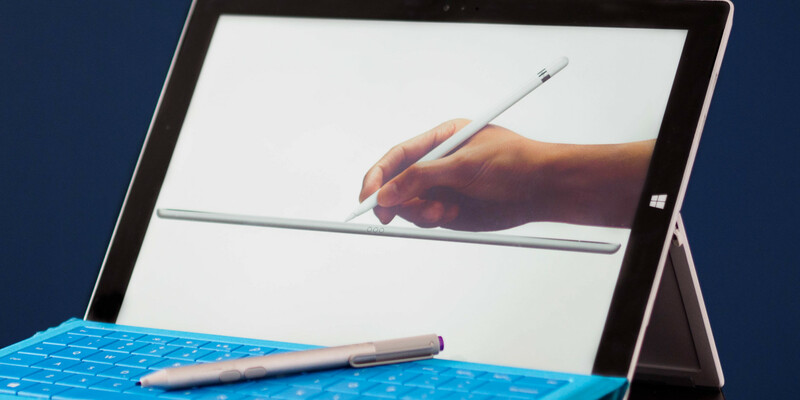 Microsoft will have to change the long-held perception of the Windows stylus as a simple note-taking accessory or basic artist’s tool. Given it’s been tryingsince 2002, that’s no easy task. What tablet PCs have always lacked is a sense of purpose. Mainly, why would I use a stylus, when my keyboard and mouse are faster – or my pen and paper feels more natural? The idea of being able to upload freeform notes to the cloud has obvious benefits, but it’s not worth the investment if the stylus can’t prove over tried-and-true interfaces and note-taking methods. But perhaps things are a bit different now. Stylus technology feels closer than everto pen[cil] on paper, and the virtual workspace and tool flexibility result in some distinct cost and convenience advantages over physical materials. Also, 2-in-1 computers are now more popular than ever – the Apple releasing the iPad Pro is evidence of that – so Microsoft want to give people a reason to use them as a tablet. Meanwhile, Artificial Intelligence is finally beginning to feel, well, intelligent. Being able to handwrite a note and have an AI process it, and then automatically create a hyperlink for a calendar event, is no longer something out of science fiction. After all, Microsoft already does so quite well with voice commands, and it will only get better. There was a common thread among Microsoft employees at Build: Windows will soon be about much more than mouse and keyboard. Touch, 3D space, voice and handwriting are all fair game. And while the mouse and keyboard aren’t going away anytime soon, the pen goes back even further. 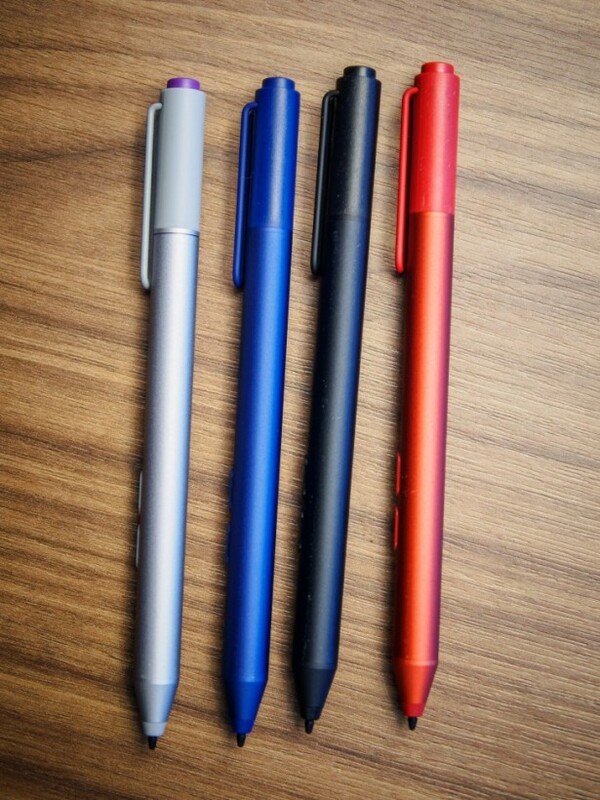 Now it’s just up to Microsoft to make the pen smart enough for our digital lives.